Republic Wireless is an MVNO that operates on the Sprint and T-Mobile networks. WiFi calling and texting is also an integral part of the Republic Wireless experience. In fact the company relies heavily on WiFi to provide service to its subscribers. Last week Republic Wireless announced that it has partnered with a national leading provider of WiFi hotspots. The result of that partnership is that Republic Wireless subscribers now have free access to an additional 30 million nationwide WiFi hotspots. If you are a subscriber to the network, your phone will now have the ability to automatically connect to those hotspots. This effectively increases the size of the MVNO's network and will help to keep costs down for subscribers. Republic Wireless charges $5 per GB of data, and users can add more data to their plan at any time. The hotspot access should help reduce a customer's need to pay for more cellular data. In order to be able to automatically connect to the hotspots, Republic subscribers will need to download the latest version of the Republic app, version 3.2 or higher. From within the app, you'll have to tap on the gear icon (pictured) to access the settings. 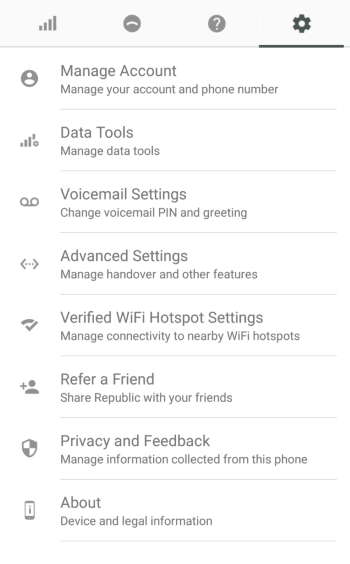 Then tap on Verified WiFi Hotspot Settings, and finally hit the slider to enable free WiFi connectivity. I'm not sure why this has to be done manually since it is essentially an expansion of the network. Perhaps in a future update, it will be enabled by default. Republic Wireless is working on a hotspot coverage map so that you can see how much of a benefit you may get from the new feature. At the moment the map has been pulled from the MVNO's website due to "technical issues." When available you should be able to view it here. Visible is only open to iPhones right now and speeds are limited to a maximum of 5 Mbps. The company has also not been very clear about how the service actually works.